A trial for a Chinese language database, Modern Chinese Books Database 中国近代华文书籍数据库, has been set up for Yale University users from now to March 31, 2019. The database has been added to the Library’s Chinese studies research guide. Since the access is controlled by Yale IP ranges, you must login Yale VPN first to get access from off-campus locations. User’s guide is available. 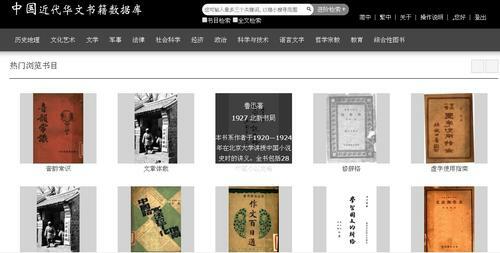 The database includes more than 120,000 books published in Mainland China during the period of 1900-1949. The digital contents will be eventually expanded to more than 150,000 from more than 40 major libraries in China. The subjects covered not only the humanistic and social sciences, but also sciences and technology.